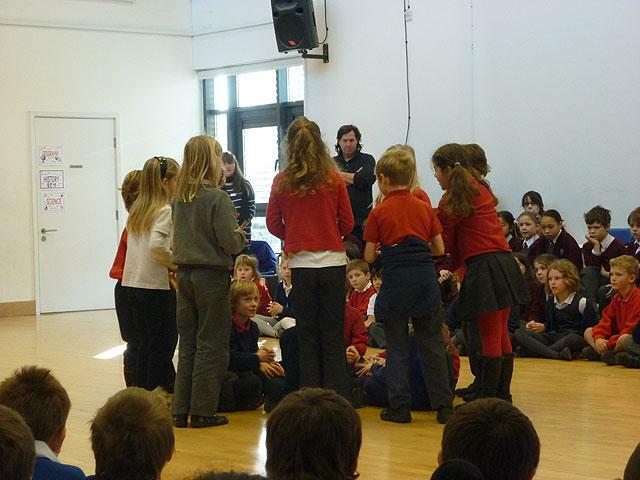 In drama we acted out Macbeth. We got taught by Paul and Liz from the Orange Tree theatre. First we acted out the whole story, then, we split into 2 groups, we focused on one part each. One group looked at Macbeth’s banquet (group 4) while the other looked at Macbeth going to see the three witches (group 5). In the three witches, Macbeth sees the three witches who trick him into thinking that he can’t be defeated. In Macbeth’s banquet Macbeth saw Banquo ‘s ghost and had an argument with Lady Macbeth at a big party. On Friday we performed to three other schools. It was lots of fun.